Phreesia’s intake platform leverages your most important resource:your patients. Allow patients to conveniently check in from their own device, at home or in your office. Give patients a private, secure office check-in experience with our easy-to-use intake tablets. Give your frequently returning or Mobile patients a quick and easy self-service intake option. Take advantage of our platform’s proprietary logic and workflows to ask the right questions of the right patients at the right time. We’ve checked in millions of patients across a wide range of specialties, and we understand the unique needs of your practice and your patients. Our specialty intake workflows guide patients through a tailored list of questions, allowing them to enter and verify their demographics, insurance data and clinical information, and helping you to capture a complete patient record. From HIPAA agreements to clinical and financial policies, we know your practice collects a broad range of consent forms. Phreesia’s Consent Management streamlines the process by ensuring that each patient receives the right forms at the right time. 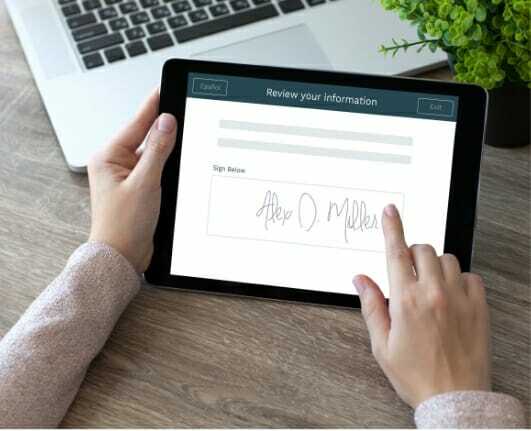 Whether you need patient consent once, every six months or annually, our automated consent forms can be customized by appointment type, capturing electronic signatures and sending required forms directly to your PM or EMR system. Phreesia’s Consent Management allows you to spend more time with patients and less time managing consents. This is the command center for your waiting room. Use the Phreesia Dashboard to efficiently monitor the intake process, access relevant patient information and manage registration exceptions. Get a clearer picture of your entire intake process. Monitor check-in volumes by location and staff member, Mobile registration rates, average check-in times, patient satisfaction with Phreesia and much more. Track the percentage of patients who check in before their visit, as well as check-in completion rates relative to scheduled appointment times.